Teleconverters are a great way to get some extra reach without having to drop some serious money for a 400mm + lens. Essential for many who are constantly cropping in on their images even with a crop bodied camera and telephoto lens. If you don't already know, a teleconverter is a small lens element attached to your lens increasing the effective focal range, typically by a factor of 1.4 or 2. Also known as an extender, tele-extender, or a doubler (2x), teleconverters are an important piece of equipment for long lens photography, but is there a limit? "Okay... so if a 2x teleconverter can give my 200mm lens the field of view of 400mm lens, would a second 2x teleconverter make it an 800mm? How about 1200mm, or even more?" Today we find out just how far we can go with teleconverter stacking. High above the streets of New York City, tourists atop the Empire State Building become the subject of our teleconverter ridiculousness. I do not suggest conducting the following experiment unless you like image quality loss and possible breakage of your camera. The distance from the lens on ground level in Madison Square Park to the 86th floor Empire State Building observation deck is approximately 900 yards (860 meters) or about 9 football fields. 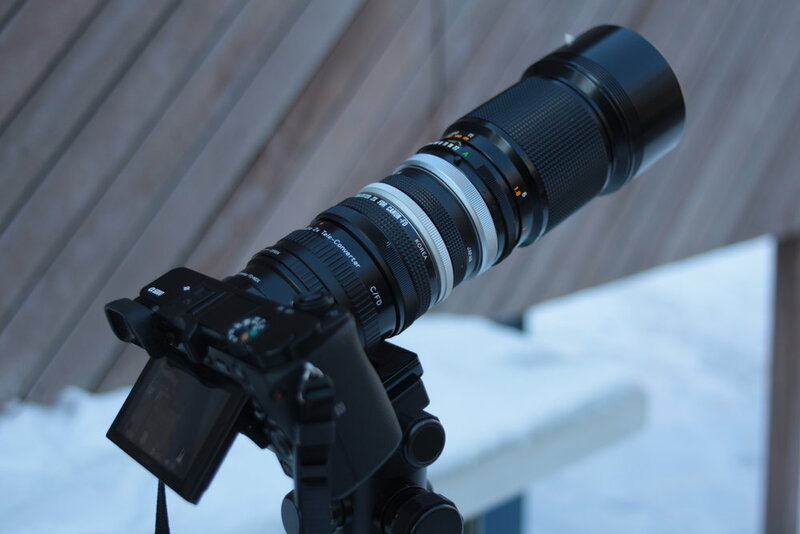 The lens is a Canon FD 200mm f/2.8 S.S.C manual focusing lens. FD Teleconverters are various brands from JcPenny (they had camera gear branded back in the day) to Canon. Camera is a Sony A6000 with a 1.5x crop factor because of the Sony APS-C sized sensor which will be factored into each scenario, starting with the first 200mm lens shot: 200 x 1.5 = 300mm. Immediately the loss on contrast can be seen. Very usable image though. Contrast lowering still, and starting to look very muddy. Usable though I don't know anyone that would stack two teleconverters for a taking a serious image. Camera lens becoming very unstable. Difficult to focus, the slightest breeze of movements of the footsteps in the snow cause the lens to wobble. The idea of the lens adapter or a connection on one of the teleconverters snapping off starts to set in. Have to put the shutter on a two second timer allow movement to settle to take the image. Impressed with the reach. Finally able to make out the motions of the people on the camera screen, wondering if I could possibly recognize someone up there if I knew them. When using the digital zoom for focus assist feature, turning the lens as carefully as possible to pinpoint focus appears to shake the image at an almost unrecognizable rate, the slightest movements are amplified so that focusing takes a lot of effort. Evaluating the sag of the lens due to the teleconverter stacking, wondering if I should end at four. Shutter timer set to 10 second delay, still may have been wobbling slightly. As I rock the focus side to side ever so slightly, not only can I not tell in-focus from out-of focus, I cannot tell what I am looking at when using the digital zoom focus assist. Shaking violently it takes every bot of the 10 second timer for the motion to settle. Looks as if viewing through a literally muddy lens. Highly visible sagging of the lens and stress on the lens adapter. One more teleconverter will surely push the rig to break somewhere along the way. It's a guessing game at this point, no way to tell if I've got the best focus for the situation. You can see from the image above the beginning and end result are overall comparable especially in terms of sharpness. 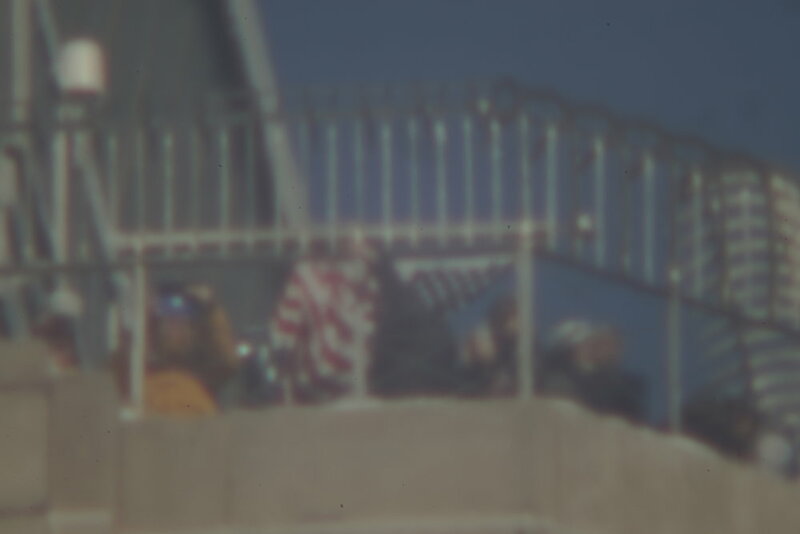 The vertical posts of the fence on the observation deck have a strange distortion in the 200mm image when compared to the image made with teleconverter stacking. I'm unsure what this is caused by, it's possible that it was caused by heat from the 87th floor which is a mechanical floor for the building. Anyway I hope you enjoyed this article and it confirmed for all of you what you already know, teleconverter stacking to 9600mm is ridiculous but a lot of fun. Photography gear used in making this article include the Canon EOS M, Sony A6000, Canon FD 28mm f/2.8, MeFoto Globetrotter Travel Tripod, and Manfrotto MKC3 Tripod.